White-washed floors, neutral walls, blond wood, large windows (double glazed), and lots of cushions. Essentially, I would like to live inside an Ikea catalogue. Is that so wrong? ..perhaps the jewellery and the shoes are not quite "essentials" for hygglig living, though they included here because they are awesome none-the-less, and will add to my snygg lifestyle. The post-its are required at present because I was reprimanded on Friday for writing a phone message on one (post-its are strictly verboten where I work. writing a note on a post-it is akin to doing a poo in a napkin and leaving it as a gift. silly me, I should have known better than to pass a quick message over on paper, and should instead have spent an extra 5 minutes converting it to email and incorrectly copying the phone number. must. try. harder) , and I need to modify the medium to get my message across more clearly: "Blah blah blah. The end." I will need herb planters for my kitchen garden, which will thrive on lack of care. I will need designer chairs because they are functional and good to look at, and not quite comfortable enough for a fat furry beagle/spaniel to sit in. I will need a blue teapot. I just will. 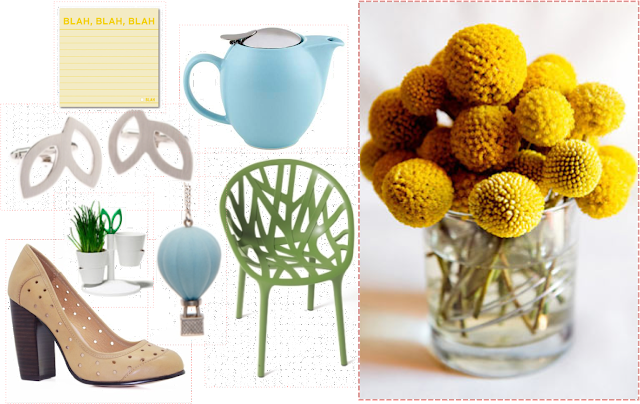 I will need some billy buttons to insert sunshiny happy colour into my neutral palette. And, I have just realised, I will need a lot of money to spend in Ikea.